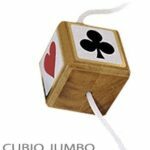 The magician holds a string vertically by its ends, and makes a wooden cube slide down along the string. Then, as he says “stop”, the cube magically stops during its fall and stays hanged challenging the gravity law! The cube measures about 2 square in. (4.5cm x 4.5cm) and its four side faces are printed with the four poker suits. It can all be given for examination, and this is what makes everything even more mysterious! Nobody will manage to repeat the trick.